Busch Stadium is the site of the matchup between the Washington Nationals and the St. Louis Cardinals on Sunday, July 2, 2017. The probable starting pitchers are Max Scherzer for the Nationals and Carlos Martinez for the Cardinals. Washington opens at -116 while St. Louis opens at +106. The Nationals have a 40-36-4 over/under record and a 39-41-0 run line mark. The Cardinals are 36-43-0 against the run line and have a 44-32-3 over/under record. The Nationals have a 47-33 overall record this season. Starting pitcher Max Scherzer has a 9-5 record with an earned run average of 2.06 and a WHIP of 0.78. He has 151 strikeouts over his 113.2 innings pitched and he's given up 65 hits. He allows 5.1 hits per 9 innings and he has a FIP of 2.72. The bullpen has an earned run average of 5.07 and they have given up 239 base hits on the year. Teams are hitting .269 against the bullpen and they've struck out 206 hitters and walked 78 batters. As a team, Washington allows 8.5 hits per nine innings while striking out 9 batters per nine innings. They are 11th in the league in team earned run average at 4.17. The Nationals pitchers collectively have given up 676 base hits and 332 earned runs. They have allowed 101 home runs this season, ranking them 12th in the league. Washington as a pitching staff has walked 238 batters and struck out 720. They have walked 3 men per 9 innings while striking out 9 per 9. They have a team WHIP of 1.27 and their FIP as a unit is 4.09. As a team Washington is hitting .277, good for 2nd in the league. The Nationals hold a .474 team slugging percentage and an on-base percentage of .344, which is good for 3rd in baseball. They rank 2nd in MLB with 9.8 hits per game. Ryan Zimmerman is hitting .339 with an on-base percentage of .380. He has 93 hits this season in 274 at bats with 62 runs batted in. He has a slugging percentage of .628 and an OPS+ of 156. Bryce Harper is hitting .313 this year and he has an on-base percentage of .421. He has totaled 86 hits and he has driven in 58 men in 275 at bats. His OPS+ is 156 while his slugging percentage is at .578. 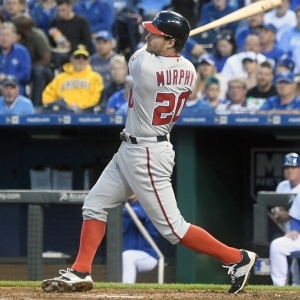 The Nationals have 781 hits, including 163 doubles and 121 home runs. Washington has walked 282 times so far this season and they have struck out 617 times as a unit. They have left 567 men on base and have a team OPS of .818. They score 5.59 runs per contest and have scored a total of 447 runs this year. St. Louis has a 38-41 overall mark this year. With an earned run average of 2.88, Carlos Martinez has a 6-6 record and a 1.07 WHIP. He has 121 strikeouts over the 106.1 innings he's pitched. He's also given up 76 hits. He allows 6.4 hits per nine innings and his FIP stands at 3.24. The bullpen has an earned run average of 4.39 and they have given up 248 base hits on the year. Teams are hitting .252 against the Cardinals bullpen. Their relievers have struck out 245 batters and walked 93 opposing hitters. As a team, St. Louis allows 8.4 hits per nine innings while striking out 8.4 batters per nine innings. They are 7th in the league in team earned run average at 4.04. The Cardinals pitchers as a team have surrendered 671 base knocks and 322 earned runs this season. They have given up 91 home runs this year, which ranks 25th in Major League Baseball. St. Louis as a staff has walked 250 hitters and struck out 668 batters. They give up a walk 3.1 times per 9 innings while they strike out 8.4 per 9. Their team WHIP is 1.29 while their FIP as a staff is 4.10. As a team, they are batting .254, good for 15th in the league. The Cardinals hold a .418 team slugging percentage and an on-base percentage of .329, which is good for 10th in baseball. They rank 17th in MLB with 8.6 hits per contest. Jedd Gyorko comes into this matchup batting .302 with an OBP of .367. He has 75 hits this year along with 40 RBI in 248 AB's. He maintains a slugging percentage of .524 with an OPS+ of 132. Aledmys Diaz is hitting .260 this season and he has an OBP of .293. He has collected 71 hits in 273 at bats while driving in 20 runs. He has an OPS+ of 80 and a slugging percentage of .396. The Cardinals as a unit have 680 base hits, including 141 doubles and 93 homers. St. Louis has walked 283 times this year and they have struck out on 639 occasions. They have had 533 men left on base and have an OPS of .747. They have scored 4.52 runs per game and totaled 357 runs this season.